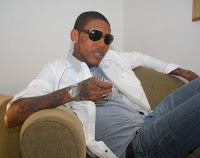 Vybz Kartel is a 35 year old Jamaican dance-hall artist out of Portmore, Jamaica. In this video clip you see Vybz in "Da building" located at Knutsford Boulevard in New Kingston which is known for its 100% dancehall music. It's also synonymous with go-go dancing. He's encouraging a few young ladies to strut their stuff. He's also got his own line of rum called Street Vybz Rum. I'm not sure how a guy in California gets a bottle of this rum, it's hard to find online. Maybe next time I'm in Jamaica I'll be able to snag a bottle for a review. It's a 80 proof brand that comes in a clear rum or a more aged dark rum. Most recently, Vybz (above) won 2010's WBLS Caribbean Artiste of the Year and EME's Male DJ of the Year. If you wanna check out his music you can score his Pon Di Gaza album via a MP3 download from Amazon for $14 found here: Pon Di Gaza 2.0 [Explicit] .